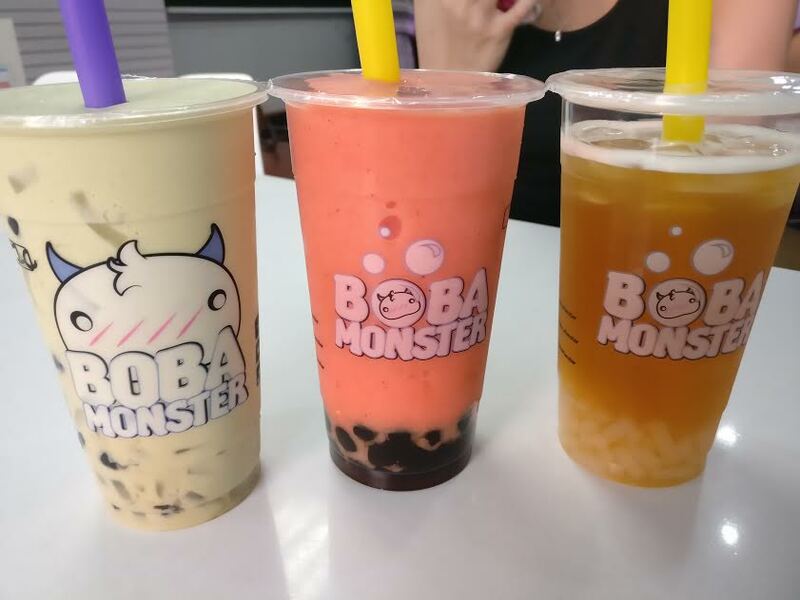 A couple of weeks ago, I was meeting up with my cousins and they suggested on going to Boba Monster. 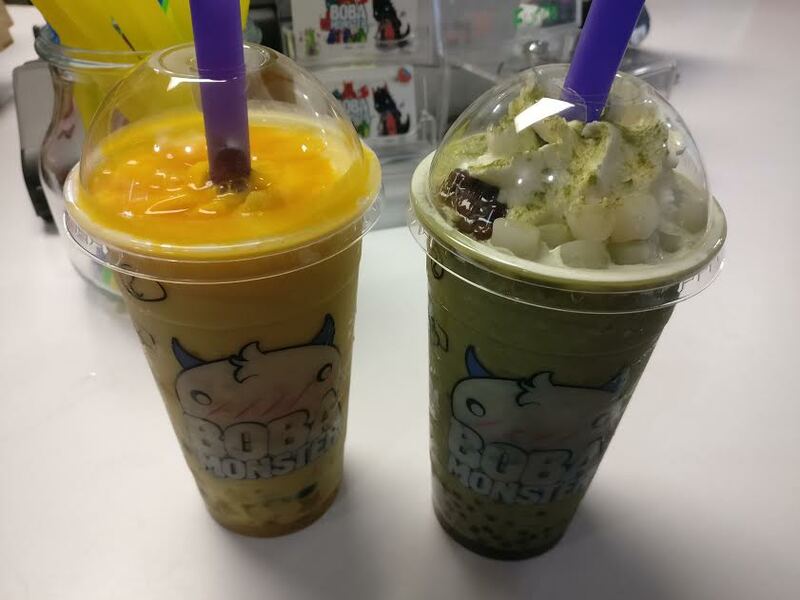 It is one of their go-to bubble tea places. I’m glad that I tried it because it was delicious! Strawberry mango slush with pearls: I can’t remember what my cousins ordered, so I’ll just describe my own. The slush had a nice consistency and was the perfect sweetness for me. 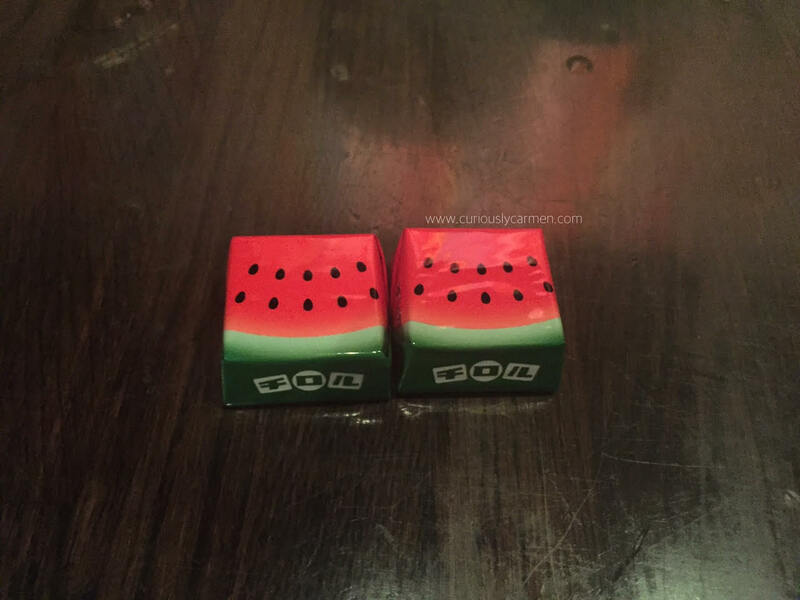 There was a good balance of fresh mango and strawberry. In addition, the pearls were sweet and chewy. Mango sago: The mango sago was one of their specialty drinks. It was a fresh mango slush with mango chunks, mango stars, and sago. Maki opted to get it without whipped cream. She didn’t have any complaints about it, and I thought that the mango stars looked really pretty inside the drink! Matcha red bean: Nigiri ordered the matcha red bean, another one of their specialty drinks! The boyfriend has been ordering this the past couple of times now too. It came with matcha slush and red bean, topped with mochi, whipped cream, and more red bean. 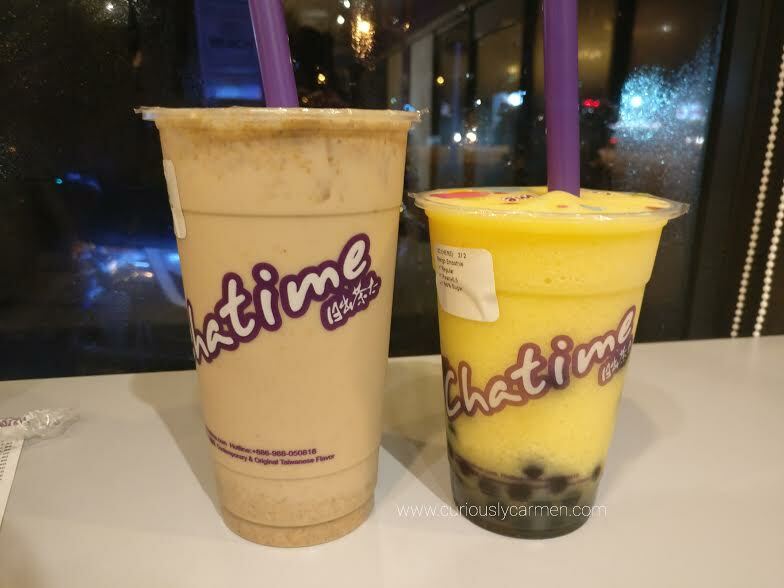 I would recommend this if you’re a fan of red bean! Red bean is just average to me so I wouldn’t order it myself. But I enjoyed the matcha portion of it. After a couple visits, we discovered that Skip The Dishes offers free delivery over $20!!! How convenient (and bad) is that! We took advantage of this deal while babysitting my cousins, because it’s only worth it if you have 4+ people. Otherwise, you would have to pay $4.75 delivery fee plus tips. 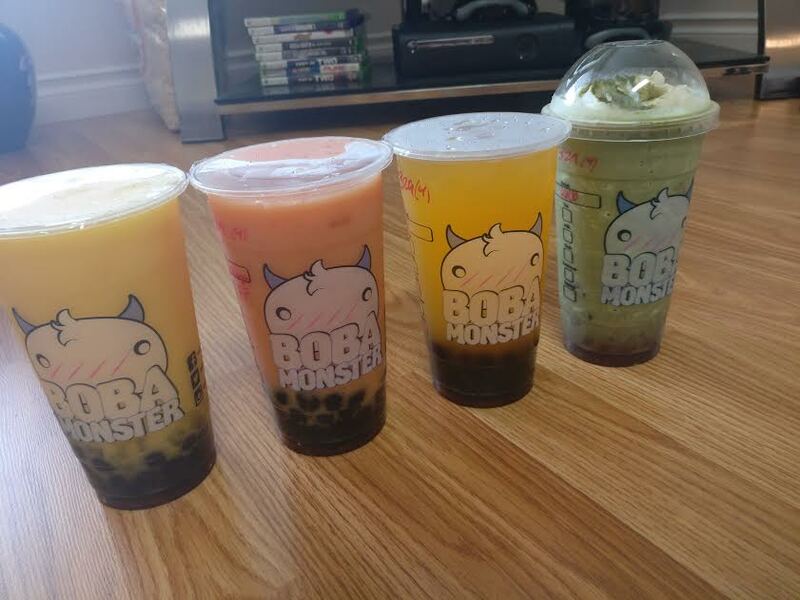 Boba Monster has not yet disappointed and I can see us coming here more often for our bubble tea fix. Especially during board games night, we can take advantage and order it with friends. Service is friendly and quick too! Mmmm, happy hour. 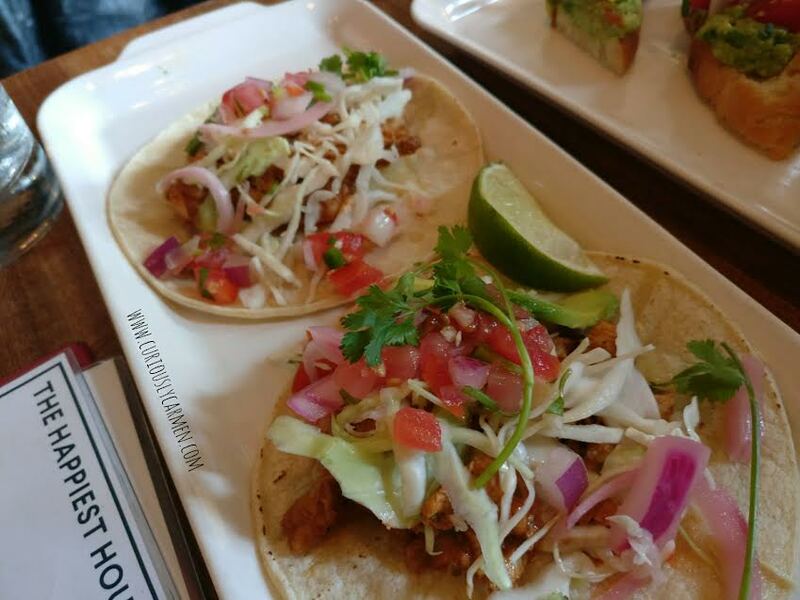 Is it weird that I go to happy hour mainly for the cheap food instead of alcohol? Cocoa suggested that we check out Earl’s for happy hour after work a couple of months ago. 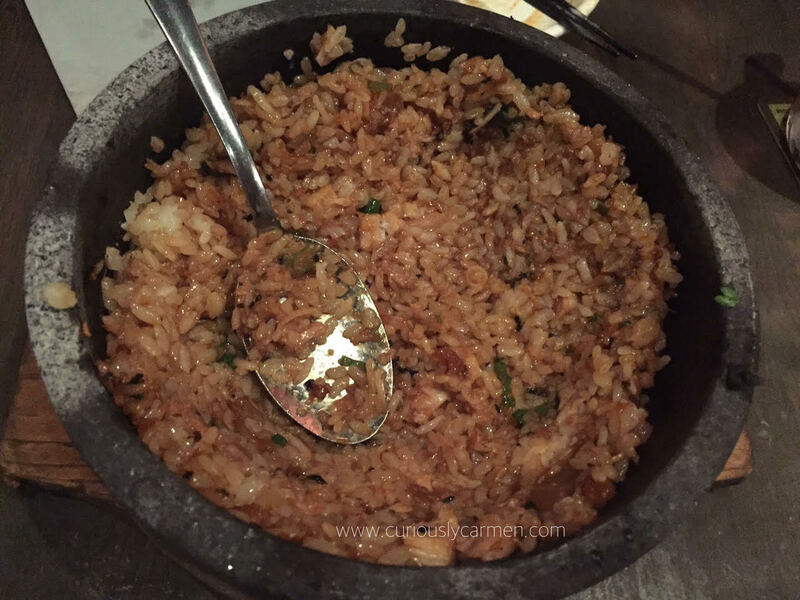 They have a pretty good menu for happy hour, and one of the perks about Earl’s is that they offer happy hour specials on Friday & Saturday nights too! The last time I went to Earl’s was over a year ago and it was for dinner, so it was my first time trying their happy hour. Here’s how it went! 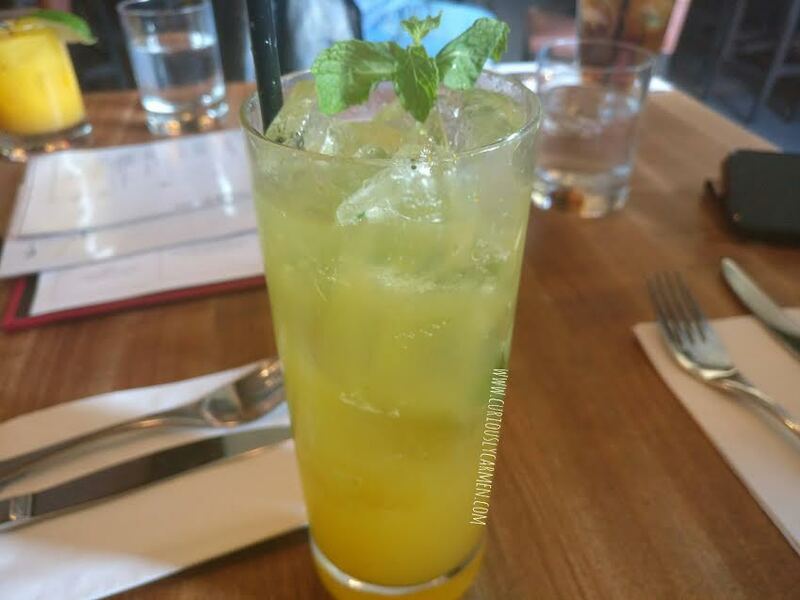 Virgin passion fruit limeade, $4.50: This came with passion fruit, mint, and fresh lime juice. It was a bit sour for my liking and I wish that there was more passion fruit flavour. Nonetheless, it was alright and a good non-alcoholic drink. 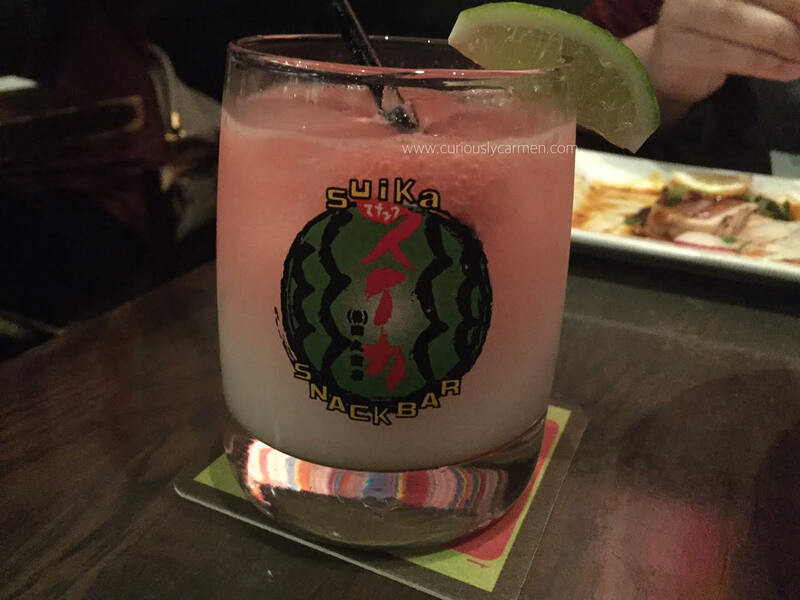 I should also mention that if you like highballs, they are only $3 during happy hour! Yes, I am aware that my virgin drink cost more than alcohol… when does that ever happen??? 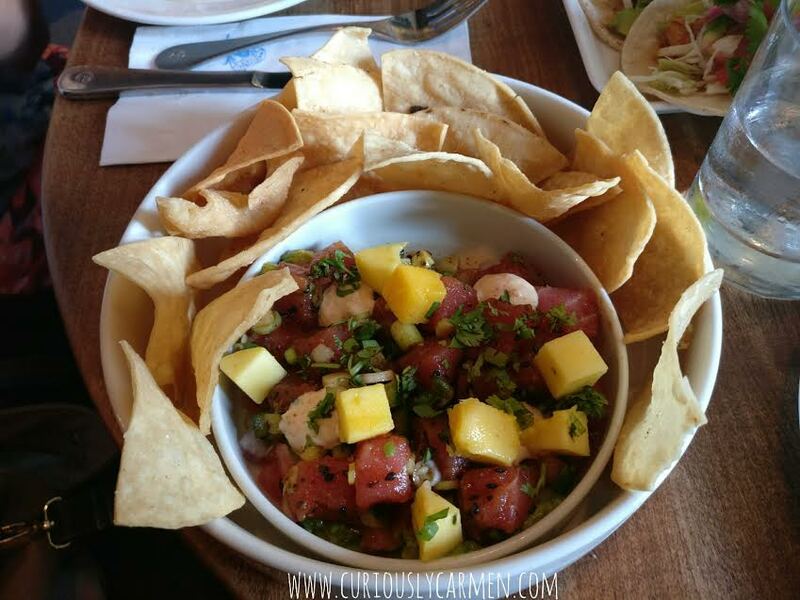 Maui Ahi Poke, $9.50: I can’t sing enough praises about the ahi tuna poke… it was so delicious! 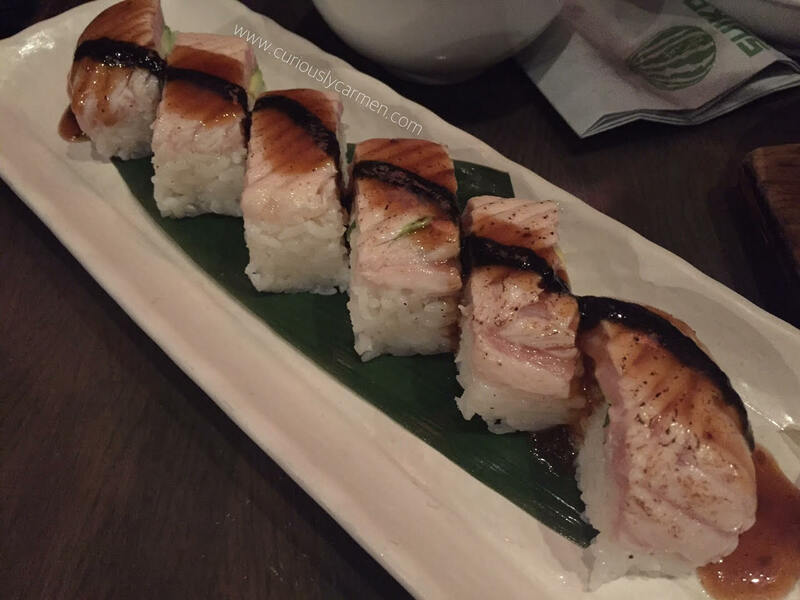 In fact, I came back here a week later and ordered the same thing because I enjoyed it that much. The poke came with some cilantro, mango, smashed avocado, and a side of chips. 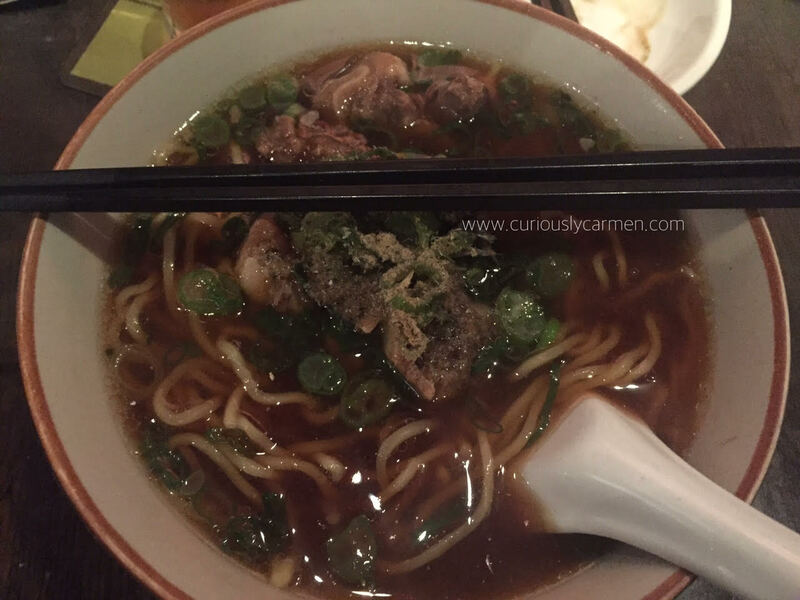 It was seasoned with sesame oil which is why I loved it so much. Whenever I make my own tuna poke at home, I use sesame oil as my main marinate so the poke at Earl’s was exactly how I liked it! I would recommend scooping the poke on the chips. A bit unconventional but the chips are really bland on its own. 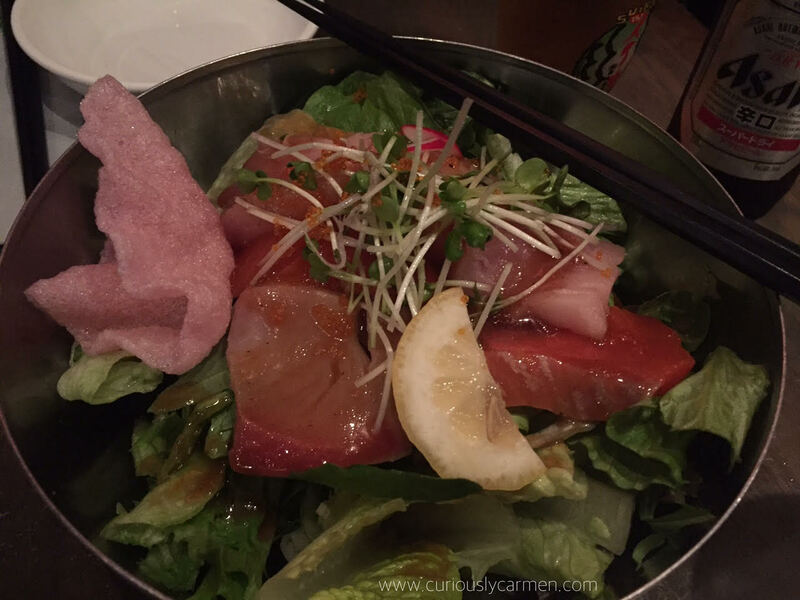 Think of it was a Western twist on poke? 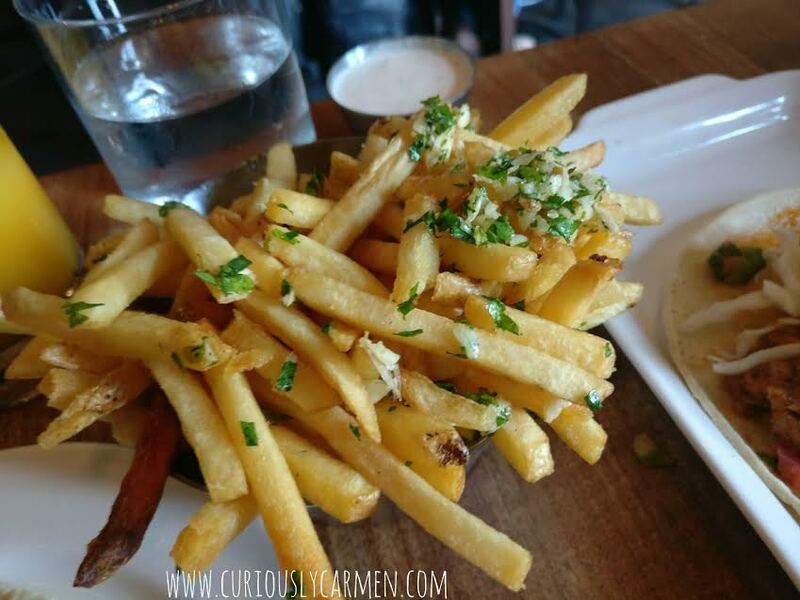 Garlic fries, $3.50: Cocoa and her friend decided to share this, but it was quite disappointing for garlic fries. There wasn’t really any garlic taste at all. It tasted just like normal fries. Chicken tacos, $7.50: We each ordered two chicken tacos for $7.50, which was a pretty decent price. 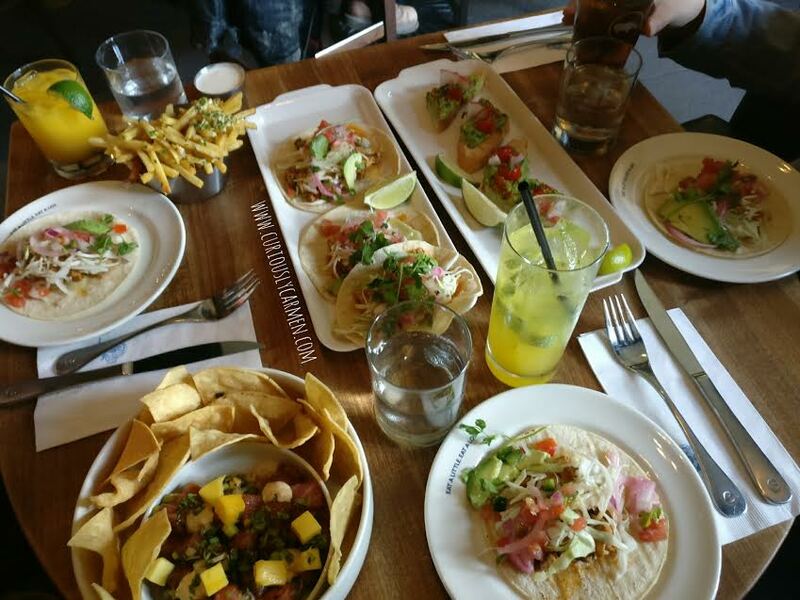 We all enjoyed the tacos. The ingredients were fresh and did a good job in filling us up. 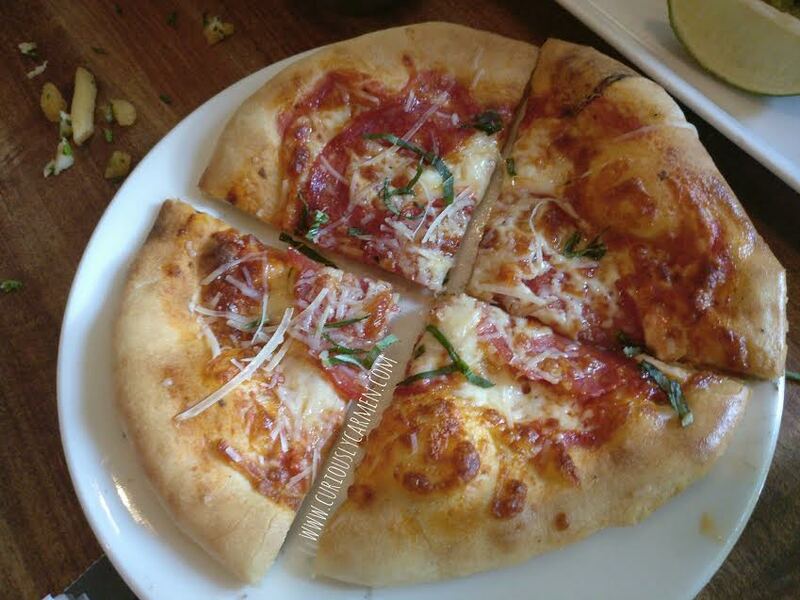 Margherita pizza w/salami add on, $5~: Without the salami, the margherita pizza was only$3.50 which is so cheap! However, do be warned that it is definitely a snack size and is quite small. Cocoa had no complaints about the pizza. 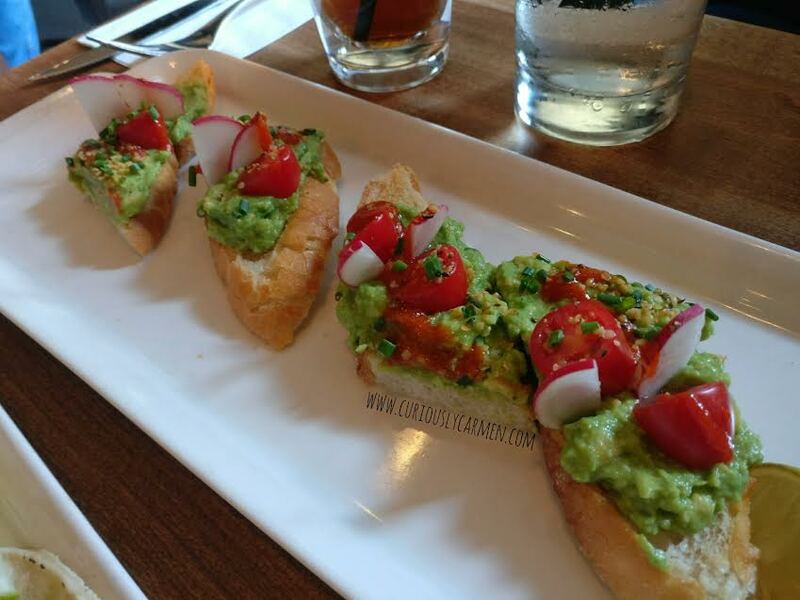 Avocado toast, $7.50: Cocoa’s friend was curious about the avocado toast, so she decided to try it. I would be lying if I said I wasn’t curious either but I never order it from restaurants as I can easily make it at home. I feel like avocado toast has also become so amusing ever since that businessman said in the news that avocado toast is the reason young people can’t afford a house these days. Anyways, the avocado toast was disappointing. 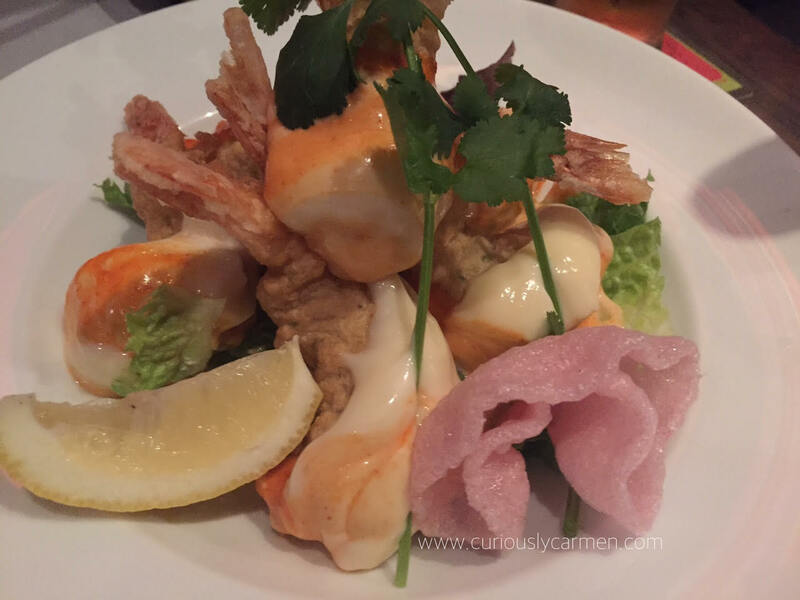 There wasn’t much flavour to it and it was really plain… definitely not worth $7.50. Service was spotty and a bit slow at times, they also forgot Cocoa’s poke and we had to ask them about it. On my second visit here the following week, we were seated and waited 15 minutes for a server. Finally, one of the servers there noticed that we had been sitting there for awhile with no one so he ended up helping us for the rest of the night. 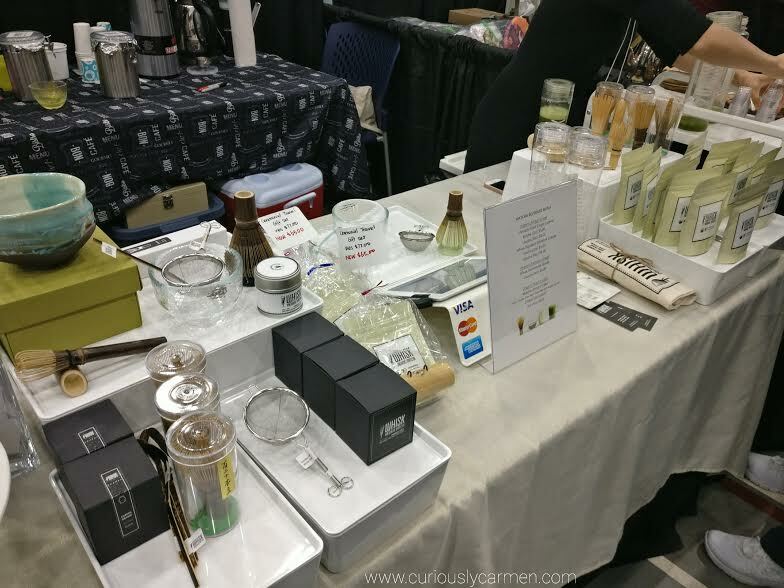 If you’ve been following my blog in 2015, you may remember that I attended the Vancouver Tea Festival and wrote about it here. I was invited back this year as well! The festival this year took place at the Chinese Cultural Center and Dr. Sun Yat Sen Garden in Chinatown. 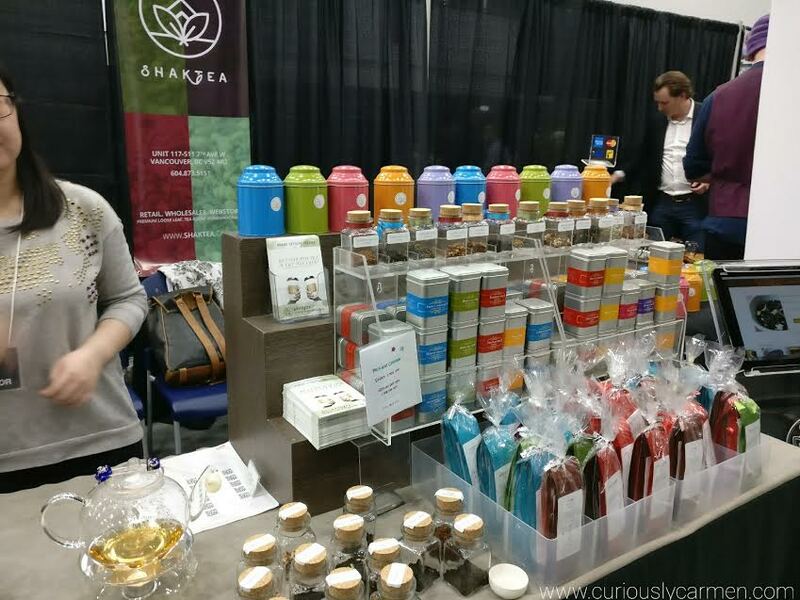 As a quick summary, the Vancouver Tea Festival brings together many different tea companies to one place. 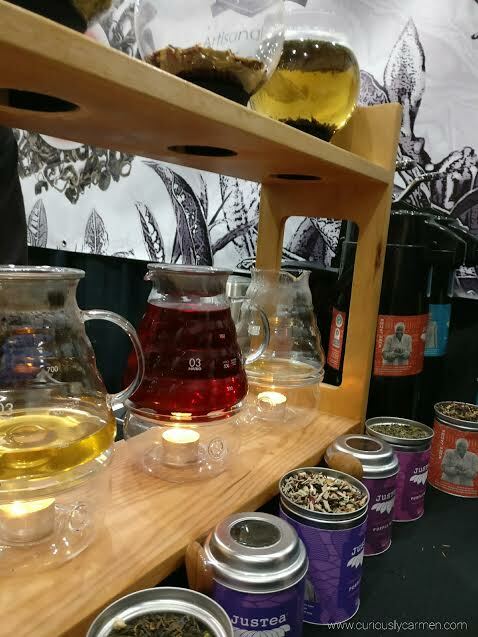 Each company has their own booth showcasing their tea. 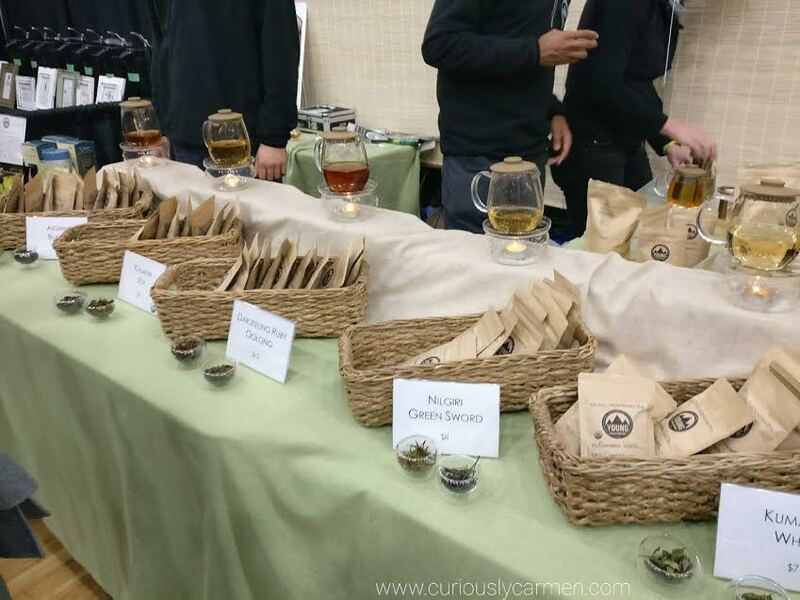 The best part of the festival is that each table gives out many tea samples so you can try their tea before deciding to purchase it or not. Smores and I had a great afternoon learning about the different tea companies and tasting all of the teas! 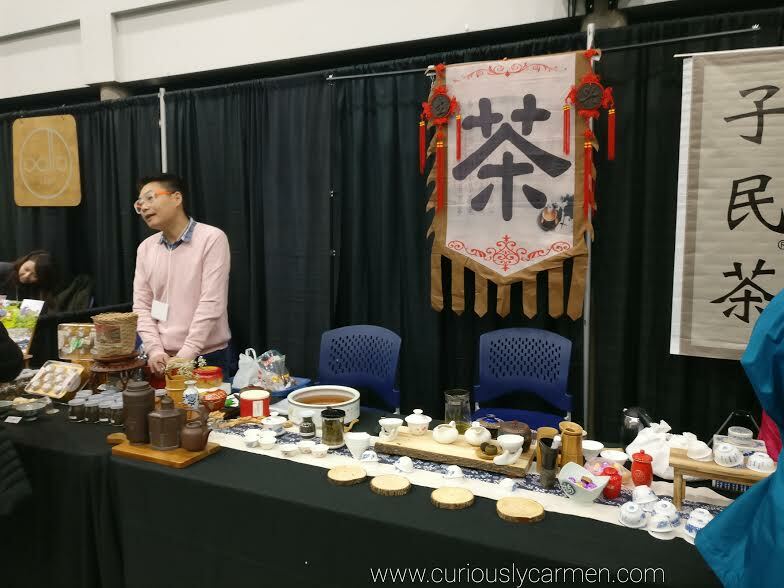 Here is a recap of the 2017 Vancouver Tea Festival! 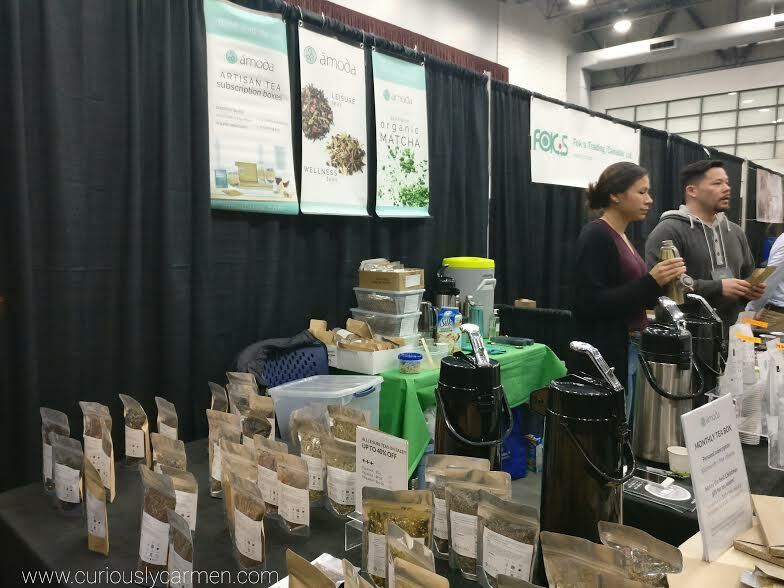 Tumeric Teas: I noticed that many tea companies at the festival were featuring tumeric in their teas. Tumeric is a spice that has recently gained lots of attention for its health benefits, although it’s been used for centuries. Tumeric Teas focused mainly in tumeric, as their name suggested. 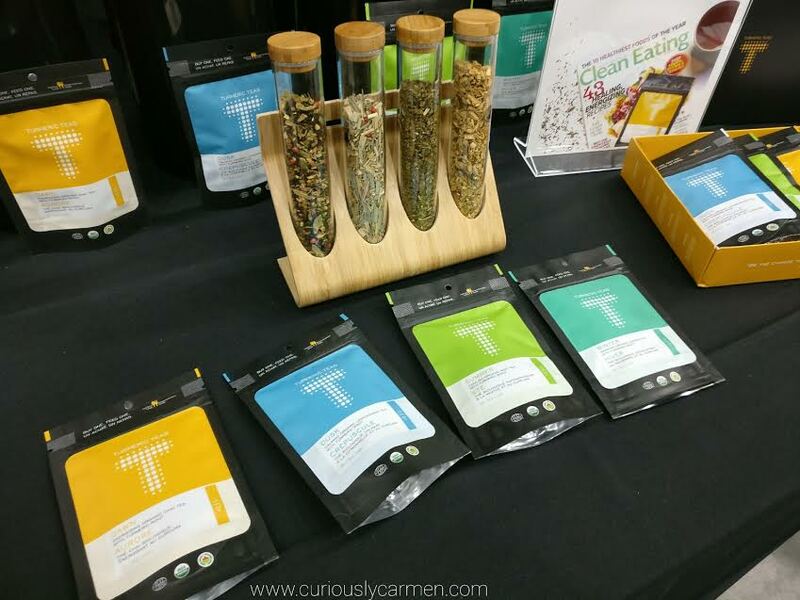 They were sampling all four of their different tumeric tea blends. We enjoyed their tea and the tumeric ginger tea would be especially great for the cold and flu season. 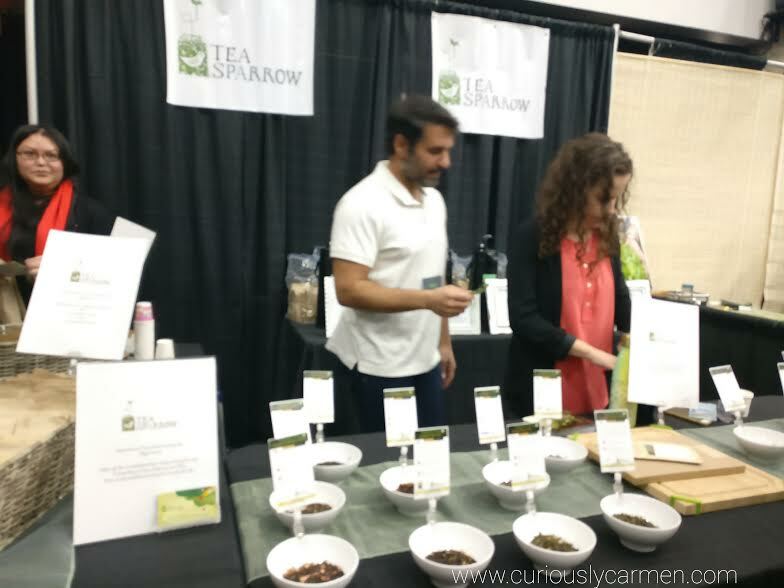 Tea Sparrow: Tea Sparrow was our favourite booth! They had many types of herbal, green, and black tea samples that we enjoyed. My favourite was the herbal strawberry mint, which I ended up purchasing. Smores enjoyed their pineapple/coconut tea the most. I also sampled a cocoa tea and peppermint tea. 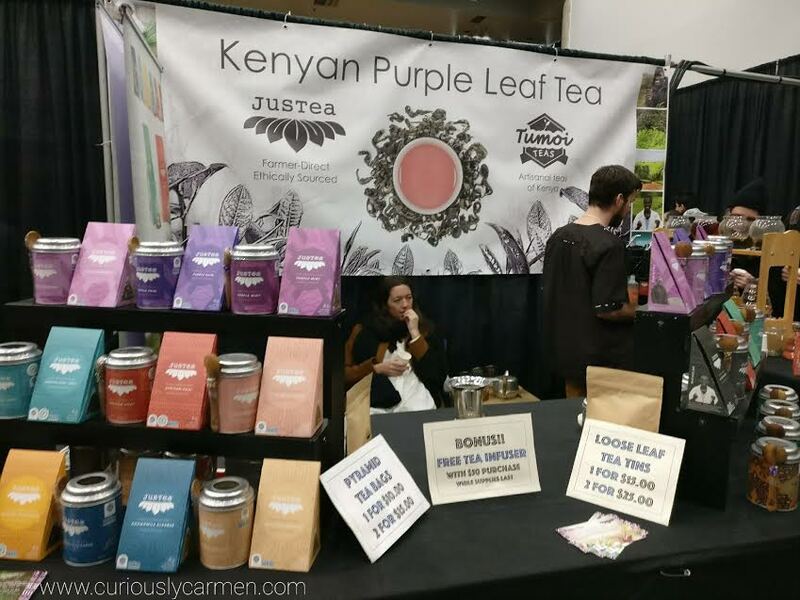 Justea: This booth specialized in purple leaf tea. Why is it called purple tea? Because purple tea leaves grow naturally in the tea bush due to the Anthocyanins antioxidant. The picture above is still from Justea. They had the coolest steepers in the festival and I thought it was worthy of a photo! Once the tea is done steeping, visitors pour themselves a sample in the environmentally-friendly glass cup provided (and are able to keep after the festival!). Oollo Tea: Oollo tea focused on oolong tea, which Smores was a big fan of! They had many different types of oolong tea on sample. Young Mountain Tea Company: Young Mountain Tea Company had a few samples featured as well! Shaktea: I remember going to Shaktea’s cafe on Main Street three years ago, and enjoying their tea. I quite liked the colourful assortment of tea tins and herbal tea sample. 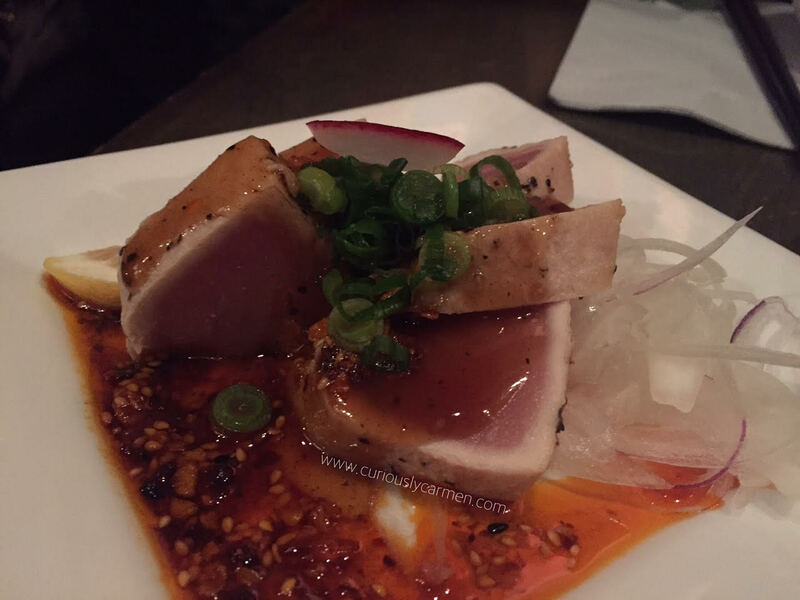 They have since moved from their Main Street location to Cambie Street, which will be opening later this month. 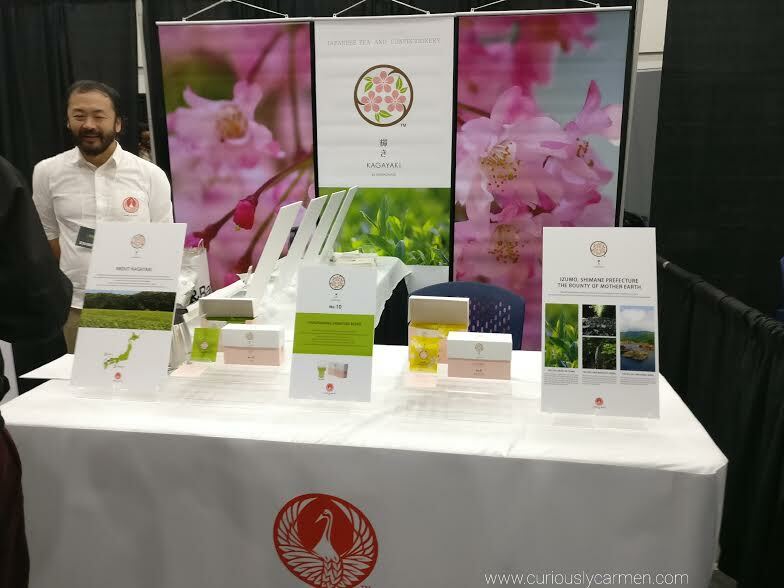 Tsuru no Maru: We were intrigued by this table because of the pretty pink flowers and simple layout (hey, marketing works okay!). Unfortunately, we didn’t get to sample their tea because the person was busy talking to other guests. Xiaguan Tuocha: This booth really brought me back to childhood, because my dad is a huge traditional Chinese tea lover. This booth had all of the Chinese tea ceremony supplies and the tea that my dad loved to drink! Amoda Tea: Amoda Tea had quite a lot of samples and we both enjoyed their teas. Whisk Premium Matcha: This booth specialized in matcha tea. I love matcha but I don’t drink/eat matcha as often as I like because of my caffeine sensitivity. The lady was quite busy with other customers so we decided to skip out on the samples here. Well, there you have it! 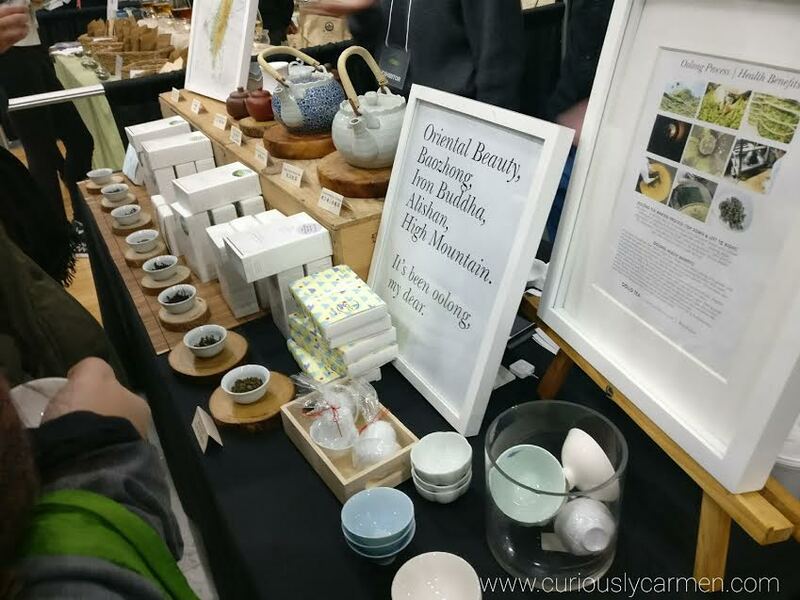 For more information on the annual Vancouver Tea Festival, check out their website here! 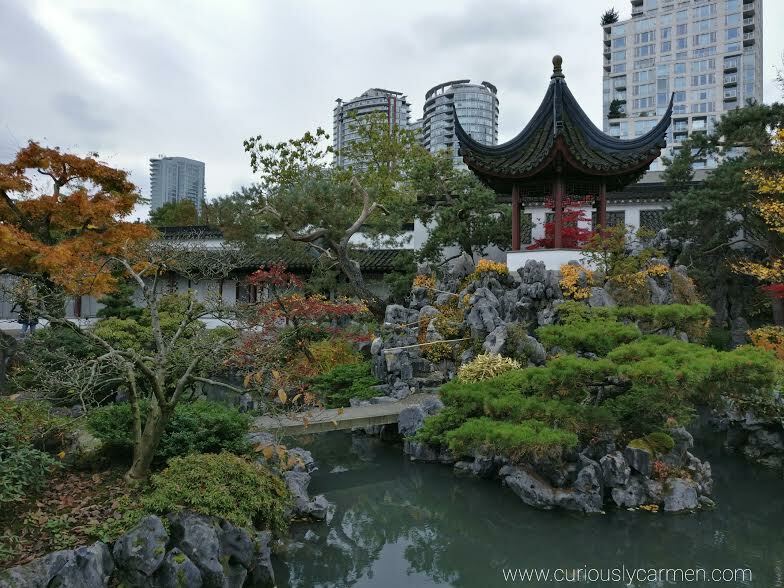 They have different ticket levels depending on if you would like to attend special workshops or exclusive tea tastings at the adjacent Dr. Sun Yat Sen Garden. Media passes provided. 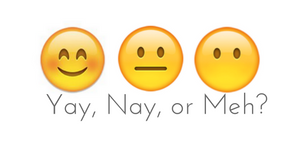 Opinions are own.